HAMBURG, Iowa (KMTV) -- — With parts of Hamburg, Iowa still underwater, the city is working hard to make sure floodwaters don't hit them again. The Hamburg Public Works Dept. and a couple of local contractors raised the dirt about 2 feet on a 3 mile stretch of the levee protecting Hamburg from the floods. In March the water came 2-3 feet over the levee. The Army Corps of Engineers warned Hamburg that it could rise up to 4 feet this weekend from rains up north. “We're right in flood season, we have no protection. 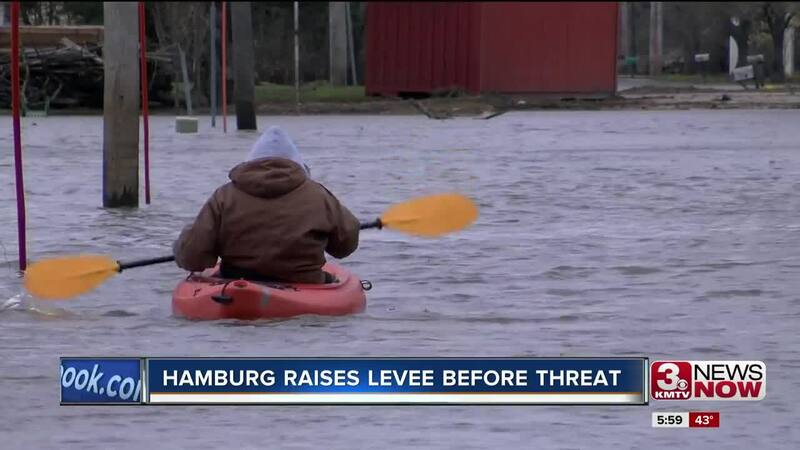 If we get any high-water event that's over 4-5 feet that tops this levee which brings it back into Hamburg. That is why we were so concerned about getting something on this to give us more protection," said Alan Dovel, Director of Hamburg Public Works. More than 100 homes are still underwater in the southside of town. Dovel says the levee was never breached, and Thursday the USACE told him the waters may only rise 2 feet instead of 4. The city says if there are no setbacks they hope to have almost all the water out of the southern part of Hamburg in about 2 weeks.